Since we have good friends in Seattle we have visited there many times. So when we called and told Barb and Jim we were in the mood for a visit, Barb started looking for things we could do that we haven’t done before. One of her suggestions was the Chihuly Garden and Glass. 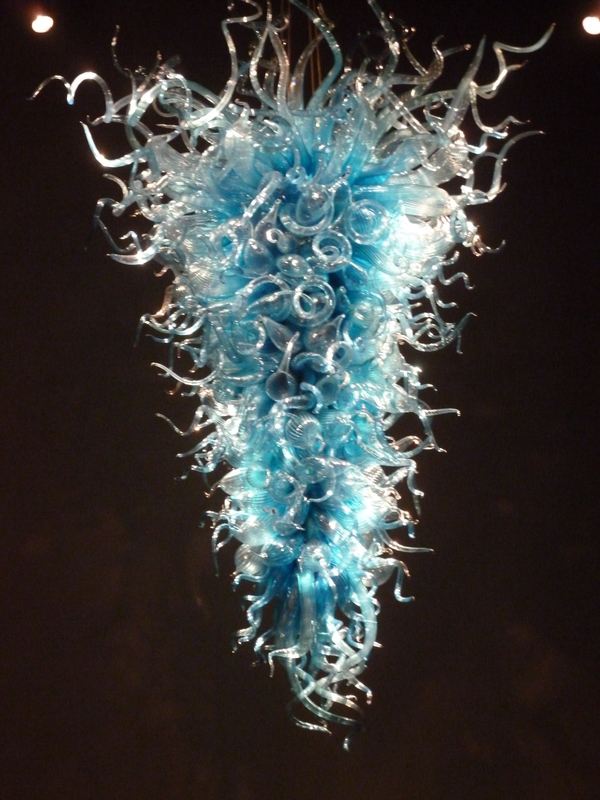 We have seen Dale Chihuly’s amazing glass sculpture hanging from the ceiling in the Bellagio Hotel in Las Vegas, so Hubby and I both thought it would be interesting to see more of his work. Chihuly Garden and Glass (http://www.chihulygardenandglass.com/) is located right next to the Space Needle and so could be combined with other sightseeing in that area of Seattle. The entrance price the day we were there was $20 for adults. 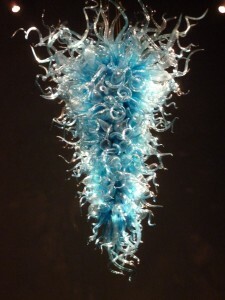 The beautiful glass sculptures did not disappoint. 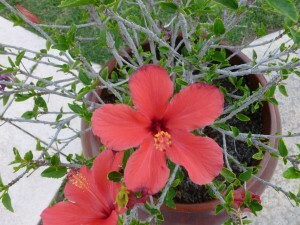 They were so vibrantly colored, you just wanted to scoop up a few and take them home to decorate the living room! 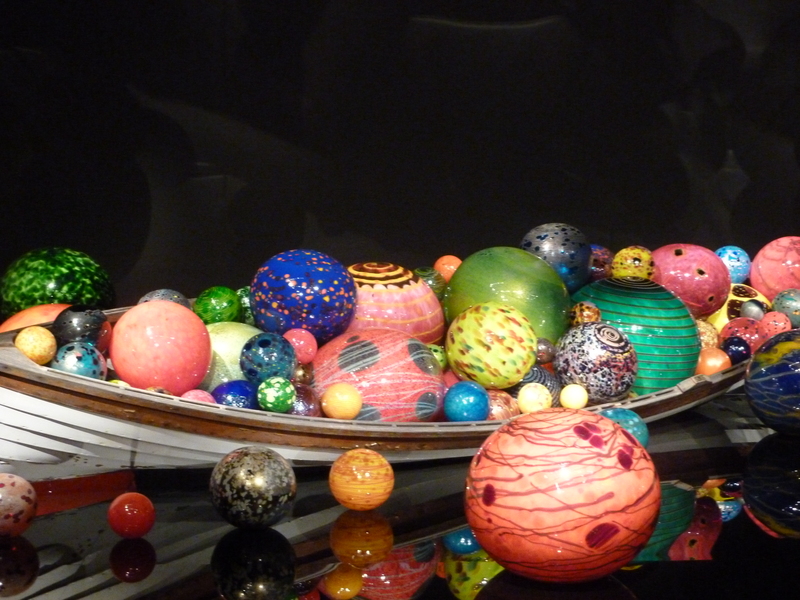 A boat full of beautiful glass balls. 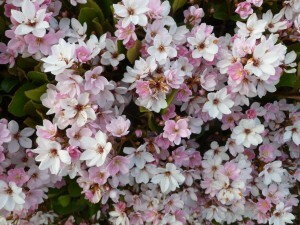 Wouldn’t they look lovely in my garden? Not upside down, but hanging from the ceiling. If the sculptures located inside were amazing, outside in the garden was even more fantastic. The garden area was full of glass shapes of all sorts. Even more interesting was the fact that they coordinated the shape and color of the sculptures with the plants they grow around them. 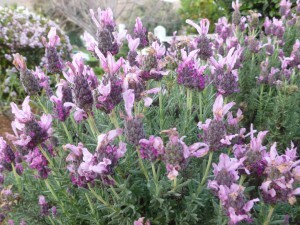 It made it a garden out of Dr. Seuss or some other fantastical realm. 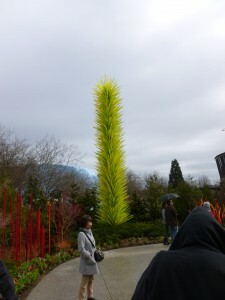 That tall lime green thing that looks like a plant is actually a glass sculpture. This may look like a scene from Star Trek, you know when they beam done to the alien planet, but we were still in Seattle, which, now that I think about it, is kind of like an alien planet in some ways…. They have a cafe at Chihuly Garden and Glass. You can enjoy it without having to enter the gallery, but with our admission we received a coupon for a free appetizer or dessert with the purchase of any entrée. Barb had eaten there before and enjoyed it so we decided to give it a try. The menu has very interesting and different items on it. For example, Hubby and I got the pulled pork sandwich (to share) which had coleslaw on it and apple butter, no BBQ sauce. Hum, you might think, but it was delicious! For dessert our friends picked the warm chocolate chip cookie with Kentucky bourbon ice cream. We had the apple cake with ginger ice cream. Again, delicious! What made the cafe even more unique is its decor. 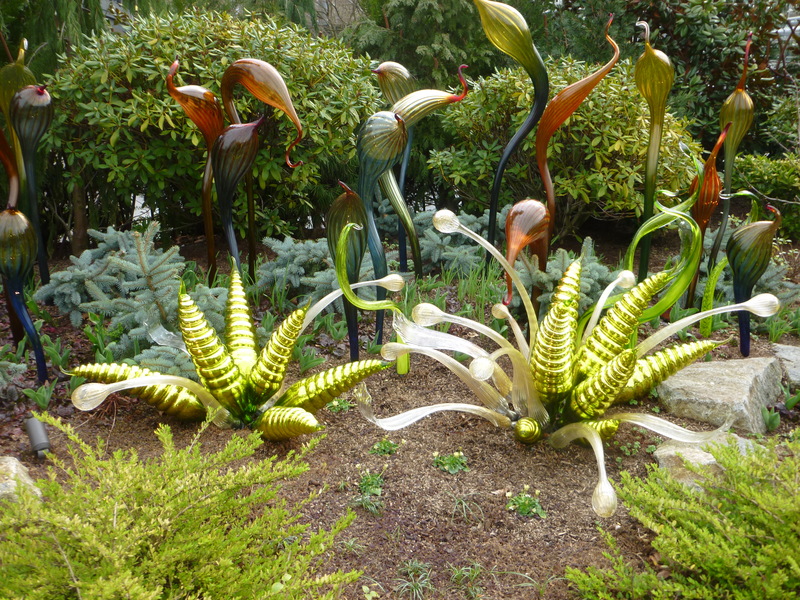 Apparently Dale Chihuly likes to collect things, lots of things. Hanging from the restaurant ceiling is his accordion collection. One big display case hanging on the wall has dozens of bakelite radios. Each table has a glass top under which is displayed another collection. Ours had silver sombreros. Another had fishing lures. Every table was different and after lunch we took a quick peak at all the empty tables and I can tell you it was an amazingly wide variety of collections. So if you have been to Seattle before like we have and are looking for a new and unique place to visit, Chihuly Garden and Glass is very interesting and enjoyable! I am hoping for a better weekend than I had last weekend. Some inconsiderate people near my home decided to have a party. They didn’t shut off the booming music until 1:17 a.m. Based on my observations (because I was up at that point, unable to sleep due to the noise) they only shut down due to the intervention of a member of law enforcement. Due to the amount of alcohol, it wasn’t just the music that was the problem. There was also a lot of hooting and hollering all afternoon and all night. There was also a bull riding machine, a porta-potty, and, in the afternoon, a live mariachi band. There were so many people not a street parking space was to be had on the whole street. We had to double park in our driveway due to the lack of parking. Just thinking about it makes me cranky. While they have never had a party like this before, these inconsiderate people (I refuse to call them neighbors) do have parties on a regular basis. If I didn’t know better I would think frat boys lived there. Here is hoping they don’t have anything to celebrate this Saturday…. Back in the dark ages, when I was growing up, and we would go to Disneyland (but only when relatives came from out-of-town), the food there was iffy and expensive. I still often hear people mention the high cost of food at Disneyland. However, I have noted over the last several years that the cost of restaurant food in the real world and the cost of food at Disneyland have come together and I find I am paying a similar price for a sandwich here at a food establishment in So Cal as I do at Disneyland. The cost of drinks at Disneyland, especially soda pop or bottled water, is still outrages, but the food cost is comparable to eating all of your meals out at a sandwich shop or a coffee shop such as Denny’s of Coco’s. The family and I just went to the Happiest Place on Earth this week (spring break!). I did not do a comprehensive survey of the prices but I did make note of the prices of what we ate as well as a few other things and thought I would share some prices with you, so you can get an idea. Chicken sandwich with avocado salsa – 8.99 (Available at the Tomorrowland Terrace) We didn’t get this this time but had it before and it was tasty. Meal with entrée (such as pot roast) and two sides (such as corn, mixed veg, potatoes , cole slaw ) 10.99 to 11.99 (Available at Flo’s V8 Cafe in Carsland in California Adventure) I noted these meals while buying a snack but didn’t have them. Hot dog and chips 6.99 (Purchased in Toontown) Decent sized hotdog. Normal condiments are available in packests and you can get as many as you want. Small individual pie (pear, cherry and cream cheese) - A little over $5.00 (Sorry, I lost the receipt) The pies were sold at Flo’s V8 Cafe in Cars Land and also available in Apple Cheddar or Mud Pie versions . The one I bought was the seasonal flavor and that changes with the seasons, I guess. Toontown has the best “food court” area in Disneyland. The three walk up window food places are collectively called “Toontown Dining” on the park map. There is a place selling individual pizzas, a place selling hot dogs, and a place selling salads, the turkey club, and ice cream. All have kids meals. I hope this helps you make when making plans for your visit to Disneyland! 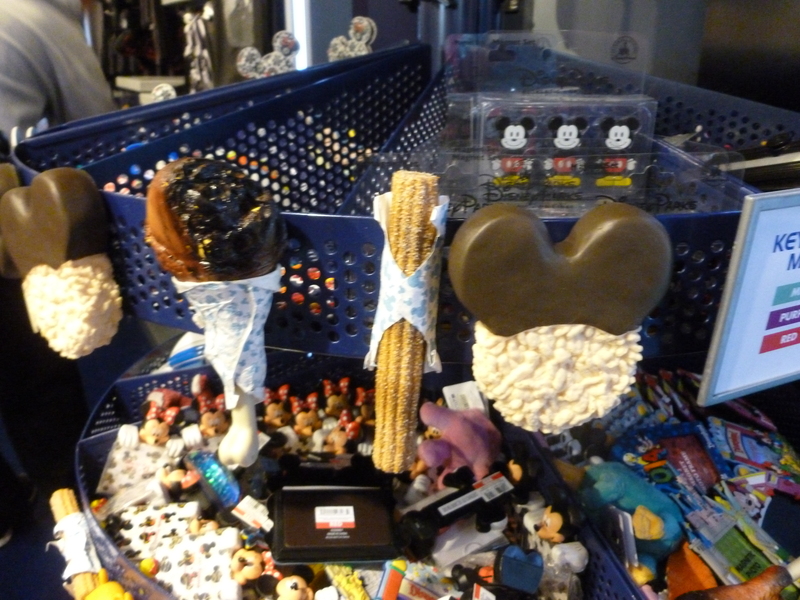 You can buy such famous Disneyland fare as he smoked turkey legs, churro or Mickey shaped rice crispy treats with ears dipped in chocolate as refrigerator magnets as a little souvinir of your visit! Up until about 15 years ago we actually managed to park a car in our garage. The other half was devoted to my husband’s shop, but at least one half of the garage was used for what it was intended - a car. Then my grandmother gave up housekeeping and we had to drag an apartment’s worth of stuff home for a garage sale. Out went my car, in went Nanny’s stuff. We had the garage sale but a bunch of stuff was left over, of course…then Hubby’s stuff started creeping into that space…and my car never made it back into the garage. Meanwhile, we also adopted two cats who hung out quite a bit in the garage and that just complicated the situation even further. When we found the house we are in now, it had a three car garage and a shop. Hubby no longer needed the garage for his many manly tools and I negotiated a parking space for my car. I thought one spot out of three wasn’t too much to ask, now was it? There are still complications. What if the now indoor cat is in the garage when I arrive? We wouldn’t want him to dart out the open door and get eaten by a coyote. What about the fact that the car would be parked near the washer and dryer, possibly getting in the way? Well, in four years those things have never been an issue because the garage has never recovered from the move. There are still boxes and boxes of unpacked things in the garage. Sigh. A small amount of sunshine is on the horizon. The Goodwill fundraiser is finally getting underway this week and I can get that batch of stuff out of the garage. On the bright side, my rummaging around out there unearthed the under the counter radio and CD player I got for the Christmas right before we stumbled on the new house to buy. There was no point in installing it at the old house so we moved it here where it languished in the garage. Hubby installed it yesterday and I am really enjoying it. Just think, I get to listen to NPR whenever I want! The kids are wondering what their father has done to them but I am delighted. But I am really delighted that one more box is out of my garage! I am frugal, I admit. So, when I buy deodorant for the girls and I, I buy Suave. It works, I like the price and we like many of the scents they have. A home run in the world of ladies deodorant. The Sunday paper happened to have a coupon for 50 cents off one Suave deodorant, so I clipped that right out. The Target ad also happened to have a coupon for $15 off $40 or more in Target brand products. I don’t shop at Target much anymore but I decided that the $15 off coupon made it worth my while. Since I was going, I threw the Suave coupon in my purse as well as a few others and took a 15 minute ride to Target. Everything went smoothly until I got to the ladies deodorant aisle. I stood there for a good five minutes looking for Suave. As a low-priced brand it is usually on the bottom shelf. But it wasn’t there. I looked and looked. No Suave. There were lots of higher priced brands, but no Suave. I found a Target employee and asked him. He checked on his little machine and said that it appeared that they were no longer carrying Suave deodorant. When I checked out I mentioned this state of affairs to the girl checking me out. She was visibly shocked because she too uses Suave deodorant. She was just flabbergasted, to tell you the truth. I hope someone at Target sees this post. Because I want to ask them, What the heck, Target? Are the armpits in Eastvale (where this Target is located) too good for Suave? Did you have a little tiff with Suave and now you are punishing your customers by making us spend more money on our deodorant? Do human beings not smell anymore and I didn’t get the memo? By the way, I just like Suave. Unfortunately, I am not getting anything for this post. For the first two weeks of her life, Youngest Daughter slept 23 out of 24 hours. It was a mother’s dream! I realize now that she saw that as her last chance to get some really good rest and had to take advantage of it. Any of you with a real go getter for a kid know what I am talking about. That little sleepy baby just turned 22 yesterday and she is still grabbing the world by the horns. While I picked a major that came to me as naturally and as easily as possible she picked a hard major, one that kicks her behind on a regular basis. But she pushes ahead. While I picked a major because, well, again, it came easily to me, she picked a major based on what would bring her the most satisfaction and rewards. How does a 17-year-old even think that way? I have no idea, because I sure didn’t. I can’t believe my baby is 22. I can’t believe how driven she is. I can’t wait to see what she does to change this crazy world we live in. Happy Birthday, Baby Girl! You go, girl! 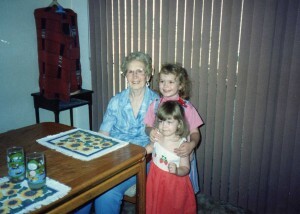 My baby, with her big sis and great grandma. Hubby and I have returned safely from our long weekend in Seattle. It is just a two-hour plane flight away, which is about as long as I would want to be on a plane for just a long weekend. Hubby couldn’t resist singing the theme song from that old TV show, “Here Come the Brides.” If you are of a certain age, you may remember the song, “The hills are greenest green in Seattle….” Well, the song is right, the hills are very green in Seattle! We visited a couple of nifty places while we were in Seattle and I will share those with you soon. Hope you had a great weekend! 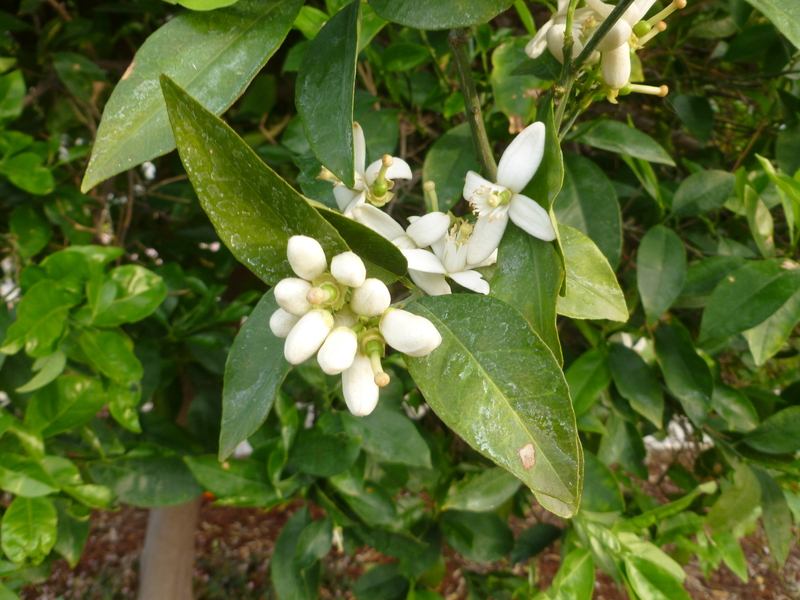 Spring is springing out all over my yard. That dash of rain we received followed by warm weather was all we needed to make things think winter is over and summer is coming. Is it? Who knows here in So Cal. We may still get a bit more cool weather before it is all over and done with. This weekend hubby and I are having a little get away to Seattle where the weather is going to be in the 50s with possible rain. That is called winter in my parts so I may have to get the rest of my winter fix while I am in Seattle. Meanwhile, here are some photos from the yard. To those of you in much colder parts, I am hoping that snow melts away soon and the flowers start blooming where you are! Honey the dog got her teeth cleaned yesterday. They do it under heavy anesthesia, thus the title of my post. Honey definitely could not have driven a car or operated heavy machinery last night! Poor thing! While she was at the vet and knocked out, I asked that they take a look in her ears. Her hearing has definitely taken a turn for the worse recently so I thought it warranted a look-see. They did find quite a bit of hair and dirt so she got her ears flushed out as well. All of this happened while she was knocked out, but she still had that “What the H*** HAPPENED” look about her all evening long. The ear flush helped give her face a drowned rat appearance to add to the whole comical look. Given that she is almost 14, she did really well and we didn’t have to pull a single tooth! Unfortunately, the ear flush didn’t seem to help the hearing much. We have begun adding arm and hand gestures to our commands now. She is a really smart dog and we anticipate she will pick up on those quickly, so as her hearing gets worse we will still be able to communicate with her. My girls are convinced my hearing is going south as well. Maybe they need to start doing hand gestures with me as well….Meanwhile the dog and I can go deaf together! A story just came to me by way of Youngest Daughter. It made me laugh and at the same time it made me shake my head in wonder and distress. An organization Youngest belongs to just had a weeklong fundraising event. It included the collection of a whole lot of change, over $1000 worth. So one night this group of young people got together to sort and roll all that change. My girls know how to roll change because they have been doing it for a very long time. In our household, money is money, whether it comes in the form of a penny or a $100 dollar bill. So the group was busy sorting, counting and rolling. Some of the young people had to be taught the mechanics of filling a money roller. You know, put your finger inside, ease the change in in small stacks so it doesn’t tilt, etc… Youngest was able to handle that, although she was really surprised that some of these kids were nearing their second decade of life without knowing how to roll change. Then, one of the kids looked at another and said, “Hey, are you counting the pennies you are rolling?” All eyes turned towards the kid who said ”You are supposed to count?. I thought you just filled it until it was full and then closed it.” Everyone was tired and Youngest was more than a little miffed by this. “Really?” She said. “You didn’t notice it said 50 cents on the side?” Yeah, I don’t blame her. So all the penny rolls had to be redone, because one person thought somehow, if you just filled a penny roller it automatically would be 50 cents. Oh boy! I asked my girls what these kids did with their change. They both said “Coin Star.” Hum…I look at coin star like a calculator. First, you learn how to do the math, then you use a calculator for convenience. First you learn to roll change, then you use Coin Star for convenience, if you don’t mind giving them ten cents of every dollar, of course. Folks, teach your kids how to roll change. They are going to have to do it at some point and you don’t want them to look like an idiot. Besides, if you teach them that coins are worth going to the trouble of rolling, you are teaching them to value money. That is my parenting advice for the day.